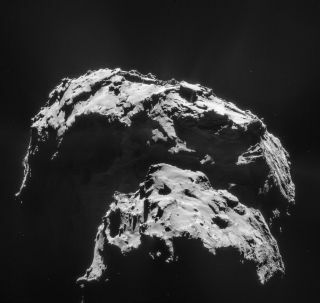 Comet 67P/Churyumov-Gerasimenko is seen here in an image captured by the Rosetta spacecraft. The mission's Philae lander hit the surface with a big bounce, demonstrating that the comet's surface is hard. NASA researchers think they understand why comets have a hard, crispy outside and a cold but soft inside — just like fried ice cream. Two NASA spacecraft have interacted with a comet surface, and both found a crunchy exterior and somewhat softer, more porous interior. Scientists know that comets are made of a mixture of rock and ice, but up until now they could not fully explain this change in texture from the inside to the outside. Scientists suspect that the very coldest comets and icy moons in the solar system contain a special kind of ice called amorphous, or porous, ice. To create amorphous ice, water vapor molecules must be flash-frozen at a temperature of about minus 405 degrees Fahrenheit (243 degrees Celsius). According to a statement from NASA, this flash-freezing process is "sort of like Han Solo in the Star Wars movie 'The Empire Strikes Back,'" — in the film, Solo is flash-frozen alive in a slab of carbonite. Amorphous ice is extremely cold, but relatively soft, like cotton candy, according to Murthy Gudipati, a researcher at NASA's Jet Propulsion Laboratory and an author on the new study. When the comet makes its way toward the sun, the temperatures on the outside become too hot for amorphous ice to survive. In the new study, the researchers re-created what happens on the comet's exterior when the temperature starts to rise. "The PAHs stuck together and were expelled from the ice host as it crystallized," Antti Lignell, a postdoctoral scholar at the California Institute of Technology in Pasadena and lead author in the new study, said in the statement. "This may be the first observation of molecules clustering together due to a phase transition of ice, and this certainly has many important consequences for the chemistry and physics of ice." With the PAHs expelled, the now-purified ice was free to form a dense, crispy outer shell around the body of the comet. Inside, the ultracold, somewhat fluffy amorphous ice remains. "Deep fried ice cream is really the perfect analogy, because the interior of the comets should still be very cold and contain the more porous, amorphous ice," said Gudipati. The PAHs, meanwhile, come together to form a final layer on top of the crunchy outer shell, Gudipati said. "The organics are like a final layer of chocolate on top."